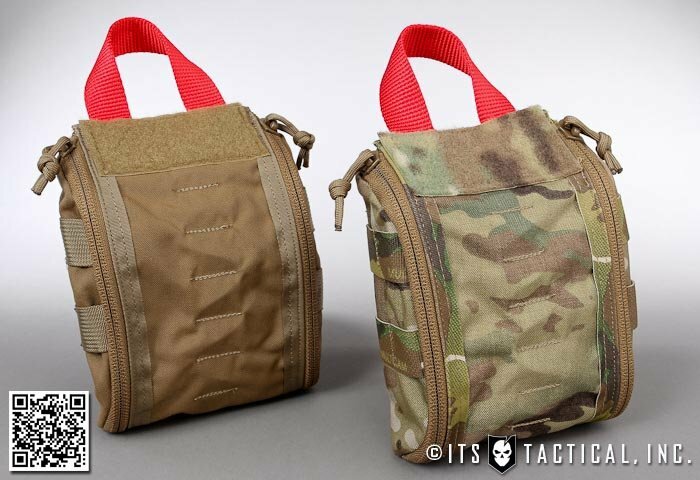 Today we’d like to review a sampling of the compact medical pouches available from OSOE (Original Special Operations Equipment). 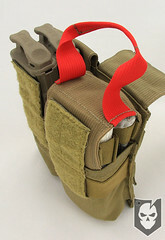 The three pouches we’ll be reviewing are the Medical Rifle Mag Insert Tray, Compact Tear-Off VOK (in both horizontal and vertical mounts) and the TK4 Tourniquet Pouch. For those of you unfamiliar with John Willis and OSOE, they began as a custom manufacturer producing bombproof gear for Naval Special Warfare and have grown into one of the leading custom manufacturers in the industry. Willis is widely known for his attention to detail and his passion for ensuring that Operators are readily equipped. OSOE policy makes it clear that incoming orders are triaged, in order to get those going into harms way the gear they need for the fight. The pouches you’ll see reviewed here today fill a void in traditional medical pouches, a subtle detail, but an important one. Width. 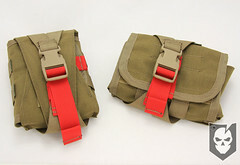 Most medical pouches take up 3 columns (vertical) of PALS webbing, which can present a problem on some of the smaller chest rigs that are run. So those that want to run a smaller chest rig, or are just limited on available space, have a few options with these new products from OSOE. The first item we’ll be reviewing is the Medical Rifle Mag Insert Tray, which is a great solution for storing medical supplies in an existing M4 mag pouch. 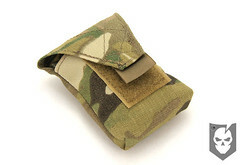 It can be inserted into a 2-mag M4 pouch as shown in our photos, but will fit into a 3-mag M4 pouch even easier. Conceptually the insert is designed to be removed quickly via the red pull handle at the top and filleted open to easily access your medical supplies. 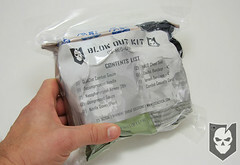 The elastic does a great job of holding all your medical supplies securely while the insert is being deployed. There weren’t any issues with flying medical supplies. We found the insert to easily hold the majority of the contents from our ETA Kit minus the HALO Chest Seal and with a smaller 2″Ace Bandage. The insert measures approx. 7″ tall x 3″ wide and a minimum of 1″ deep. The depth can of course expand as more contents are packed in. Front and back panels of the insert have an internal stiffener integrated, which we suspect is a thin strip of HDPE for added rigidity. On top of the insert is a 1″ red webbing pull handle that has been sewn together at the apex to give the handle some support. Red webbing has become synonymous with medical equipment and makes the handle easy to identify as such. 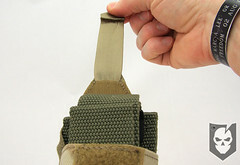 On the interior of the insert there are six 1″ elastic retention straps to hold your medical equipment. Two of these are double layered for further organization of NPA’s and Decompression Needles. Next up is the OSOE Compact Tear-Off VOK (Ventilated Operator Kit), which provides a simple, compact and easily-accessible way to organize your medical supplies. The Compact VOK is available from OSOE in a variety of ways, in this review we’ll cover the vertical and horizontal tear-off options. It’s also available without the tear-off feature using direct PALS mounting or even a custom option with velcro loops for attaching it to a belt. While there is definitely more room in the Compact VOK than the Rifle Mag Insert Tray, it still stays true its compact nomenclature. With the simple clip of the side-release buckle on the tear-off panel, the Compact VOK can be pulled away from its velcro attachment and easily deployed next to an injured victim. As mentioned previously, the tear-off velcro mounting configurations come in either horizontal using 3 columns of PALS, or vertical taking up just two colums of PALS. The back of the Compact VOK features two strips of hook velcro which mate with the loop velcro field on either of the mounting options. 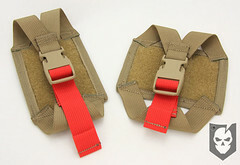 It’s further secured with 1″ webbing straps affixed with a side-release buckle and easily identifiable 1″ red webbing. The aforementioned tear-off panels measure 5″ x 3.5″ depending on the orientation (horizontal / vertical). The pouch itself measures 6″ tall x 4″ wide and 1 3/4″ deep without contents and in its vertical orientation. Unfolding the pouch requires pulling the 1″ red webbing tab on the vertical opening, followed by pulling another tab horizontally. 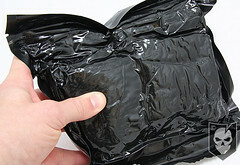 This reveals a large pocket to the right, and plenty of elastic to hold your medical supplies. We were able to fit even more of our ETA kit inside this pouch and could definitely fit everything in, but it would significantly increase the depth. The great thing about the closure on the Compact VOK is that OSOE has large velcro strips on both the vertical and horizontal flaps, so realistically you could fit a whole lot in here, but that would take away from the compact nature of the pouch. One last great feature of the Compact VOK is the single column of PALS running down each side of the pouch to easily mount a Tourniquet. This can be done with Rigger’s Rubber Bands (as shown in our photos) or with the many Tourniquet mounting options that OSOE produces. 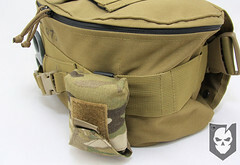 Speaking of Tourniquet mounting options… last but not least is the OSOE TK-4 Tourniquet Pouch. We’re really impressed with the functionality of this compact Tourniquet Pouch, which enables the TK-4 (or similar sized Tourniquet) to be quickly deployed. This is done with an ingeniously simple webbing pull-tab. Upon opening the pouch, a simple pull on this tab will pop out your tourniquet. You’ll also see in our video below how easy it is to re-prime the webbing to use again. While this isn’t necessarily an important point, it does illustrate that the TK-4 pouch is not a one-time use pouch. We’ve also found another great use for this pouch. It can be used to carry a pair of nitrile gloves in, which can easily be dispensed as quickly as a TK-4 Tourniquet. 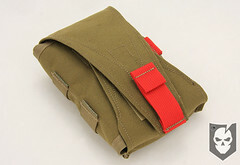 The OSOE TK-4 Tourniquet Pouch measures 3.5″ tall x 3″ wide and less than an inch in depth if stored flat. 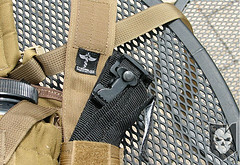 A single column x three rows of PALS provides the attachment on the rear of the pouch with a small MALICE Clip (not included). 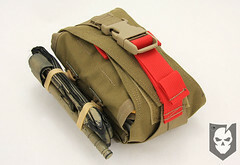 An additional mounting option due to the small footprint of this pouch, is to attach it directly to a sling so you always have a Tourniquet available. It’s good to have options when it comes to storing medical supplies, and with the array of pouches from OSOE, you’re guaranteed to always have room for your medical equipment. 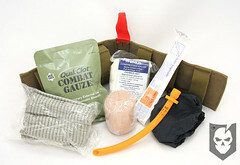 There’s no excuse for not carrying the essential lifesaving equipment needed on your kit. 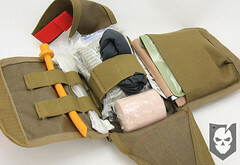 These newer medical pouches from OSOE are not yet reflected on their Web site, but available from the Tactical Response Gear Store online. 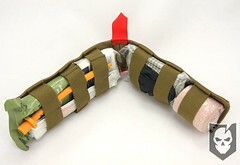 Announcing the ITS ETA Trauma Kit Pouch! New Updates to our ETA Kits!